The global radar sensor market size was valued at USD 8.5 billion in 2017 and is anticipated to grow at a CAGR of 20.5% during the forecast period. Radar Sensors are devices designed to detect moving or stationary targets. Radar sensors use Frequency Modulated Continuous Wave (FMCW) radar to detect objects such as cars, trains, trucks, and cargo in extreme weather conditions. Radar sensors offer a sensing range of up to 40 meters, and are used for collision avoidance in forklifts, mining vehicles, and port machines. Radar sensors are developed for long-range outdoor applications owing to their ability to withstand conditions such as wind, rain, fog, light, humidity, and air temperature. Radar sensors offer benefits such as the ability to detect both stationary and in-motion vehicles, flexible mounting, easy and safe installation and maintenance, and higher accuracy. The Radar Sensor market is driven by factors such as increasing need for surveillance, and growing security concerns worldwide. Radar sensors are used for surveillance in various applications such as airports, solar farms, oil and gas production facilities, power plants, and railways. There has been an increasing need for surveillance in the defense and law enforcement sectors owing to growing security threats and terrorism. Increasing demand of radar sensors for border monitoring and access to sensitive areas supports the radar sensor market growth. Increasing investments by governments all across the world for improvement of infrastructure and increasing need to provide safety offers growth opportunities for the radar sensor market. High demand for radar sensors in the government sector including federal agencies, local, and state governments for various purposes such as border monitoring, infrastructure security, and homeland security are contributing significantly to the radar sensor market growth. One of the major factors positively affecting the growth of the radar sensor market is the large investments by governments across the world due to increasing disputes, regional unrest and terrorism. There has been a significant increase in demand of radar sensor from the automotive sector, which further fuels the growth of the Radar Sensor industry. Radar sensors are increasingly being used in automotive applications such as obstacle detection, autonomous emergency braking system, predictive crash sensing, and speed sensing. They use surround sensing technologies for parking-assistance systems, collision-warning, and adaptive-cruise-control systems. Radar sensors are being used in driver assistance systems owing to increasing cases of road accidents, which would provide numerous growth opportunities in the Radar Sensor market. The global Radar Sensor market is segmented on the basis of type, range, component, end-user, and region. The Radar Sensor market report segments the type into Imaging Radar Sensor, and Non-Imaging Radar Sensor. The Non-Imaging Radar segment accounted for the highest Radar Sensor market share in 2017. 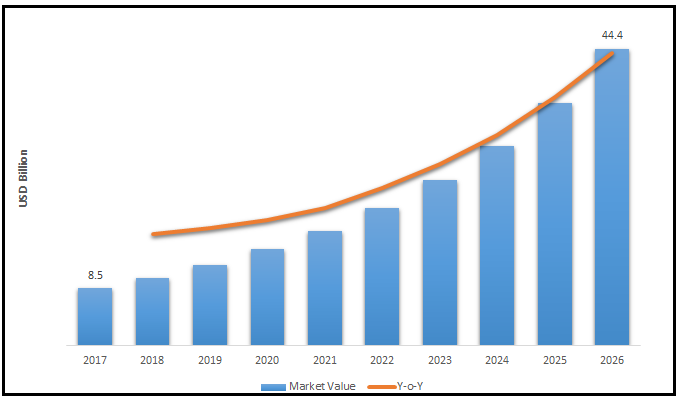 The rising demand for non-imaging radar sensors from defense, automotive, and traffic monitoring applications boost the growth of this Radar Sensor market segment. The range segment is divided into Short-Range Radar Sensor, Medium-Range Radar Sensor, Long-Range Radar Sensor. The component segment is divided into Transmitter, Receiver, Processor, Antenna, Video Amplifier, and others. The Radar Sensor market report segments the end-user into Aerospace & Defense, Automotive, Security & Surveillance, Industrial, and others. The automotive segment is expected to grow at the highest rate during the forecast period. The increasing demand of technologically advanced vehicles from countries such as China, U.S, and Western Europe contributes significantly to the growing adoption of radar sensors. The continuously increasing popularity for autonomous vehicles, and self-driving vehicles creates lucrative opportunities for the radar sensor market. This report comprises a detailed geographic analysis of the Radar Sensor market across North America, Europe, Asia-Pacific, Latin America, and MEA. North America is further segmented into U.S., Canada, and Mexico. Europe is divided into Germany, UK, Italy, France, and Rest of Europe. Asia-Pacific is bifurcated into China, India, Japan, and Rest of Asia-Pacific. North America is the major region contributing to the Radar Sensor market growth due to rise in air traffic, and increasing focus on improving safety for passengers. The U.S. government has been using aircrafts for various defense, and security purposes as well, thereby increasing the radar sensor market growth. The leading players in the Radar Sensor market include Delphi Automotive LLP, Autoliv Inc., Robert Bosch GmbH, NXP Semiconductors N.V., Continental AG, Lockheed Martin Corporation, Denso Corporation, Infineon Technologies AG, Hella KGaA Hueck & Co., and Smart Microwave Sensors GmbH among others. These leading players are introducing innovative products in the Radar Sensor market to cater to the growing demand for consumers. Global players are entering new markets in developing regions to expand their customer base, strengthen market presence, and increase their Radar Sensor market share.